by David Mitchell, 2015, 256 pages. TLDR: 3 out of 5 for compelling characters in an interesting mystery, through maybe too much exposition. Slade House is billed as a haunted house story in the vein of Shirley Jackson's Haunting of Hill House, and it certainly starts off that way. In this book we encounter one character after another (total of five in all) as they tell us in first person how they stumble across the mysterious Slade House. Slade house itself lies hidden beyond a garden, behind a half-sized metal door, off a very tight and inconspicuous alley. The first character is a 13-year-old boy, who has accompanied his mother to the house for a musical recital, where she hopes to make some connections. They discover a wealthy house full of music, and a garden full of fruit. The second character is a police officer who stumbles across the house while following up on a lead about the disappearance of the boy and his mother nine years earlier. He discovers a lonely widow who is apparently in need of company, and thus they find they have something in common. The third character is young woman in a university paranormal society who is tagging along behind the other members of her society investigating the alley because of mysterious disappearances every nine years. They discover a frat-house holding a huge party. The fourth character is a reporter, sister of the third character, who has been contacted by an amateur sleuth of the supernatural and who has much to say about the house and it's supposed owners. The fifth character is a psychologist from Toronto, who has been invited to the house for professional interest (the amateur sleuth mentioned in the fourth chapter was her patient). She arrives at the house with a surprise of her own. 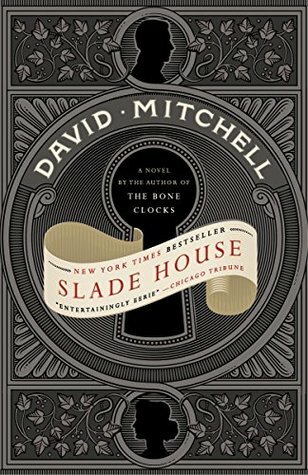 Slade House is a tight little novel, and Mitchell really manages to bring his characters alive, especially the police officer and member of the paranormal society. The first three chapters follow a formula in which a hapless character stumbles across the house and becomes trapped, but this begins to fall apart in the last two chapters, and in this the structure of the book echoes the malice behind the house. Where this book very much differs from a Shirley-Jackson-style haunted house story is that in the end we get an explanation for why the house is as it is, and who the characters that inhabit it really are. Whether this is a feature or a detriment will very much depend on the reader. Recommended for anyone that likes an occult mystery that gets solved, for those who like characters to leap off the page, and for those who are suckers for weird houses in the back alleys of London. 3 out of 5.